The stock is up almost 700% in the last five years, but there's room for more gains for investors. 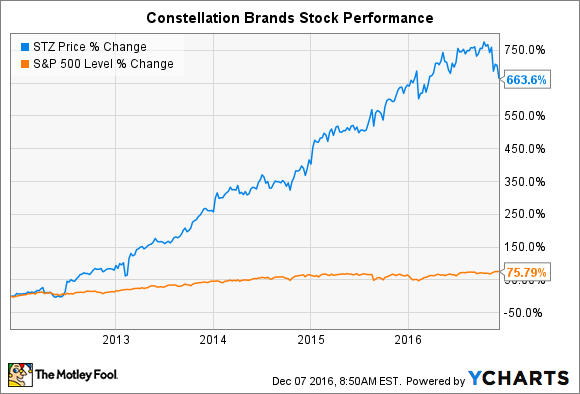 Constellation Brands' (NYSE:STZ) (NYSE:STZ-B) stock has trailed the market slightly over the past 12 months -- but is up over 600% since 2012 to trounce the S&P 500's 76% gain. Below, we'll highlight the key points that investors need to know about this leading alcoholic beverage company to see whether that incredible growth streak still has legs. Constellation Brands competes in the three major alcoholic drink categories of wine, beer, and spirits, but has the heaviest reliance on beer. Wine accounted for 40% of sales last year, spirits for 5%, and beer for the remaining 55%. Corona has been one of Constellation Brands' best performing beers. Image source: Constellation Brands. The company is the leader in the premium beer segment of the U.S. market, with exclusive sales rights for popular Mexican brands including Corona, Modelo, and Pacifico. Corona is the best-selling imported beer in the country and the fifth most popular beer overall. Wine and spirits have been selling well, yet beer -- and particularly the Corona Extra and Modelo Especial brands -- are the real stars of the show. Constellation's beer portfolio soared by 20% last quarter to far outstrip wine's 12% increase. The booming results convinced management to raise their sales and profit outlook to roughly twice the rate of the broader industry. The surging market share is accelerating profit growth and putting the company on pace to generate as much as $6.45 per share of earnings this fiscal year, up 19% over 2015. Constellation Brands is benefiting from rising profitability as operating margin climbs toward 30% of sales, which puts it right on par with global industry titan Anheuser-Busch InBev (NYSE:BUD). Meanwhile, the company is plowing a large portion of those earnings right back into the business. It plans to spend $1.2 billion this year on capital projects as it progresses along in its $4.5 billion plan to greatly expand its Mexican beer production capacity. "These investments," CEO Rob Sands recently told investors, "will ensure that we have the capacity, quality, control, and flexibility to meet expected demand for our iconic beer brands well into the future." Unlike more established industry giants, Constellation Brands counts acquisitions as a major part of its growth strategy. It spent $1 billion to purchase craft beer specialist Ballast Point Brewing last year and management continues to scan the market for add-on opportunities like that. Executives aim to use the company's marketing and distribution strengths to raise the profile of the brands it acquires, just as they have accomplished with the Mexican beer portfolio they bought from InBev for $5 billion back in 2013. Even after its huge run-up over the past five years, Constellation Brands doesn't look particularly expensive relative to other industry players. Investors can purchase shares at 23 times expected earnings, which compares well both to InBev's 30 P/E multiple and to Molson Coors' (NYSE:TAP) 24 P/E. The same trend holds when looking at a price-to-sales valuation, where Constellation Brands weighs in slightly cheaper than rivals. That reduces the risk of overpaying for this business as the stock is 15% below the all-time high it hit following a blockbuster third-quarter earnings announcement in early October. The key challenge going forward will be for Sands and his executive team to protect sales growth momentum in the face of fierce competition from both domestic and imported beer brands in the U.S. But if they can hold on to the market share progress they've made lately, while prudently expanding capacity and tacking on profitable acquisitions, then the stock should continue delivering intoxicating gains for investors from here.